To read and print out the entire newsletter, click the above image. Please be patient, the file size is about 800Kb. Please support our advertising sponsors: Danville Band, Diablo Printing, East Bay Flowers, Fari Falaki (Better Homes) Gagen McCoy (Sarah Nix), Jennifer Krommenhoek (Sotheby’s), Omnibus Organizing (Joy Perkins), Spirit Space (Bill Williams), The Maids, The Peasant & The Pear. 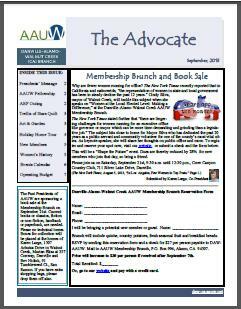 Submission deadline for the October Issue of The Advocate is September 15. Please provide all website, newsletter or calendar submission through our submittal webpage.